Test / Dev environment! – Do more with the backup data. Every backup is a fully-hydrated snapshot on the Cohesity platform. Example: You can spin up 20 virtual machines in as little as 10 seconds – no data need to be copied due to patented SnapTree technology. Analytics! – Let the backup data be more than insurance. Use it with built-in apps like “pattern search” and “password detector” to run analytics on copies of production data. During the demo of Cohesity all of these things shines. PowerPoint presentations does not do the product justice. One of the features we demo is our Policy Driven approach to protection of data. It will only take a few minutes to put the numbers in a policy. Below I have created the “Gold Protection Policy”. Once we have the policy we simply need to attach it to a VM / Folder / Cluster / DataCenter / TAG in vCenter. 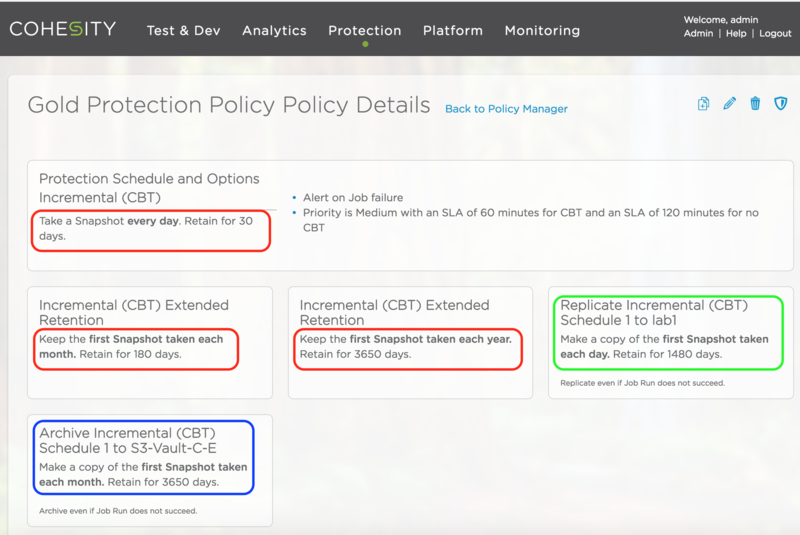 Then the VM will be protected with the policy.